This is part of HotWhopper's Flashback series. It's not about climate but I figure I can squeeze it in because it mentions wave and tide power and desalination. I came across it when following up research on my last article - it mentions the Nautilus submarine, the first sub to go under the North Pole - back in 1958. ARLINGTON, Virginia (Associated Press). -—To Vice Admiral C. B. Momsen (Ret. ), all this emphasis on space is a little bit ridiculous. Man's future, he insists, is on this planet —in and below the ocean. Submarines carrying hundreds of passengers will speed from the United States to Europe at 225 miles per hour, quietly, cheaply, safely. Cargo subs will cross the top of the world under the North Pole, at 70 miles an hour. Behind them will trail a mile-long chain of sausage-like rubber containers filled with 12 million gallons of oil. Fish farms in the ocean depths will supply the bulk of the world's food. The force of the ocean tide, currents and waves will be converted into electricity in giant underwater power plants. Submarine "mining camps" will sweep the ocean floor, harvesting a fabulous wealth of minerals. Extracting plants will process the limitless acres of sea water for gold, copper, magnesium and dozens of other essential elements. Vast reservoirs of oil and natural gas beneath the ocean floor will be tapped. Sea water will be converted to fresh water, pumped inland, and used to transform vast desert regions into garden spots. Science fiction? Not all all. All these things are feasible, says the Admiral, and will come about just as soon as man is willing to put forth the time, money and effort. The oceans, their power and their resources are Momsen's business, and have been for 38 years. He graduated from the U.S. Naval Academy in 1919, and two years later went into the submarine service. He stayed with the underwater ships until his retirement in 1955. Since then he has served as a consultant to a number of U.S. firms interested in under water travel or resources. 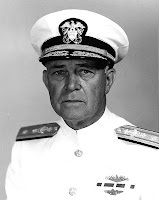 If his name sounds familiar, it is probably because he gave it to the famed "Momsen Lung," which he helped develop as an individual escape apparatus for men trapped in sunken submarines. The device is still in use today by navies all over the world. He also had a big hand in developing the diving bell which saved the lives of 33 men trapped in the submarine "Squalus" off Portsmouth, New Hampshire, in 1939. "We have all gone a little crazy about this outer space business, just to keep up with the Joneses," says Momsen: "The ocean is the place where we should be putting our efforts in order to provide for future generations. "The population of the world is expanding at a tremendous rate. Within a few hundred years at the most people will have to look else where for the things they need. They will find them all in the sea—the world's last great unexplored frontier." Submarines cannot go below 1,000 ft. now, but a submarine is being developed, Momsen says, that should be able to go down 10,000 ft. That would hit bottom 75 per cent, of the time, although the maximum depth of the ocean is known to be about 36,000 ft. When the atomic-powered Nautilus sailed under the North Pole last August, broad new vistas were opened in the field of underwater commerce. Here was a route that would cut nearly 5,000 miles off the 11.200-mile iourney from London to Tokyo. Here was a possible new way to carry oil from the fields on Canada's Hudson Bay to the factories of Europe and America. U.S. Rubber, one of the firms for which Momsen is a consultant, has been developing rubber containers for the transport of liquids for more than 15 years. The company visualises the day when cargoes will be hauled around the work by submarines towing a series of containers, 20 ft in diameter-and 400 ft long. Each container would bold a million gallons, and each submarine could putt a chain of them 5,000ft. long. There are about 75 different liquids—acids, oils and alcohols—that could be transported this way, plus a great variety of such items as dry lime, grains, fertilisers. Big oil tankers cannot get into shallow water harbours to unload. But a submarine cargo train could surface outside a small harbour, cut one of the containers loose and let it be towed into the harbour by tugs. The top speed of the U.S. atomic-powered submarines is still a military secret, although it has been announced as being in excess of 20 knots (about 23 miles an hour). Now in the process of development, says Momson, is a plastic-type coating designed to cut down the drag which any ship encounters in going through the water. Submarine speeds of 70 miles an hour will be entirely possible, he says. That is more than twice the speed of the S.S. United States, the world's fastest ocean liner. "But that is not the limit, by far," the Admiral declares. This coating, plus expected improvements in power plants, can boost the speed of submarines up to 225 miles an hour." Nuclear power is not the complete answer to greater speed undersea. "The ultimate engine may be an entirely new type that uses some substance which reacts with salt water in the way that a petroleum product mixes with oxygen to produce a combustible mixture. "A new method of propulsion may be found, doing away completely with propellors. Water-jet propulsion is a possibility." There are a number of advantages the Admiral can see in submarine passenger vessels. "They would be faster than any surface ship, more comfortable than any aeroplane. The passengers could have their own cabins, more room all round. Under the surface there is almost absolute calm; no one could set sea sick, or suffer motion sickness. The passengers would not know they were moving. "Passenger subs could operate on definite schedules. The wildest surface storms could not wash out the trip. A traveller could journey from New York to London and not know about a North Atlantic storm until he read about it in a newspaper." Passenger and cargo-towing submarines are not on. the drawing board now, and will not be until there is a demand for them. That demand, Momsen believes, will come first from the military. And he notes with satisfaction the increased interest since the development of the Polaris missile, which can be fired from a submerged submarine. "In World War II, 14 million tons of Allied shipping were sunk in the Atlantic, 6 million tons more in the Pacific. If we could have built the cargo subs then, they would have been economically practical because they would have been necessary." The same holds true for the vast riches of the sea, the Admiral says. "We know that in every cubic mile of sea water there are approximately 20 million tons of minerals—including 90 million dollars worth of gold and 400 tons of magnesium. And we know there are more than 300 million cubic miles of this sea water. "The Scripps Institution of Oceanography found an area of thousands of square miles in the South-East Pacific literally covered with nodules— rock-like pieces of valuable ore from the size of a man's fist upward. Scripps estimated their value at 500,000 dollars per square mile. It's a mystery where they came from, but they are just lying there waiting to be picked up. Off-topic: a fascinating tale of Momsen and the Squalus rescue is Peter Maas's book "The Terrible Hours"